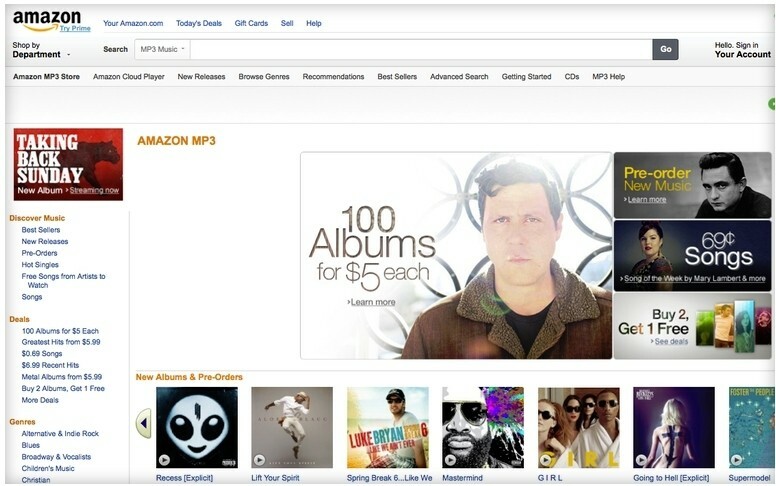 Amazon is preparing to bolster is Prime subscription service once again this summer with the introduction of a streaming music service. It won’t compete directly with today’s top offerings like Pandora or Spotify, however, as it’ll be limited to songs and albums that are at least six months old according to a report from BuzzFeed. The unnamed service will reportedly work across multiple devices and platforms, allowing users to search for specific tracks. Much like Spotify and Rhapsody, users will also be able to play a track as often as they’d like and there will even be some offline capabilities. The service, which could lunch as early as next month, is well on its way to becoming reality. Sources claim Amazon has reached agreements with Sony Music Entertainment and Warner Music Group as well as multiple independent labels following months of discussion. It’s unclear at this hour if Amazon has inked a deal with Universal Music Group, the third major label. Streaming music is poised to be the next big thing in the music industry as sales of digital tracks continue to decline. According to data from Nielsen, sales were down 12.5 percent during the first quarter of this year while streaming was up 34.7 percent. Amazon is no doubt hoping the offering will be yet another reason for members to stick around (and a way to attract new subscribers) in the wake of the company’s first-ever Prime price hike earlier this year. The annual subscription now sells for $99, up $20 over the original price.